"Our favorite place for a cozy, quiet retreat." ~ Amy P.
The Bender Room: Feel the Calm come over you in the Bender Room, decorated in Cream and Blue. Featuring a Queen Size Bed, Gas-log Fireplace, Balcony and Large 5-foot Walk-in Shower. It is handicapped-friendly and located on the first floor. The Jamison Room reminds you of Spring with it's Soft Green and Cream accents. This cozy 1930’s Bedroom Suite, has a Vintage feel with Modern Comfort. This room features a Queen Size Bed with a soft pillow-top mattress, Gas-log fireplace and Walk-out first floor Balcony. Private Bathroom with Walk-in Shower. The Barrett Room with it's Soft Silver and Plum accents is a most restful place. In the Historic Wing of the Inn on the second floor, the view of tree tops is relaxing. It offers Guests a King-Sized Bed, Gas-log Fireplace and a Spacious Bathroom with a Garden Jacuzzi Tub as well as Shower. The Mathers Room: A touch of France in the Taupe and French Blue Colors of this Room greet Guests on the Second Floor. It offers a Gas-log Fireplace and a Jacuzzi Garden Tub and 4-foot wide Shower in the Bath. Relax at our Bed and Breakfast in Bloomington! The Finley Room: A large and cozy Corner Room is decorated with Gray, Cream and Peach accents. the Finley Room has it All with a King-Sized Bed, Gas-log Fireplace and Balcony. Its Bath is Luxurious with a Large Jacuzzi Tub as well as Shower offering Gilcrest & Solmes and Greenwich Bay Luxury Amenities. 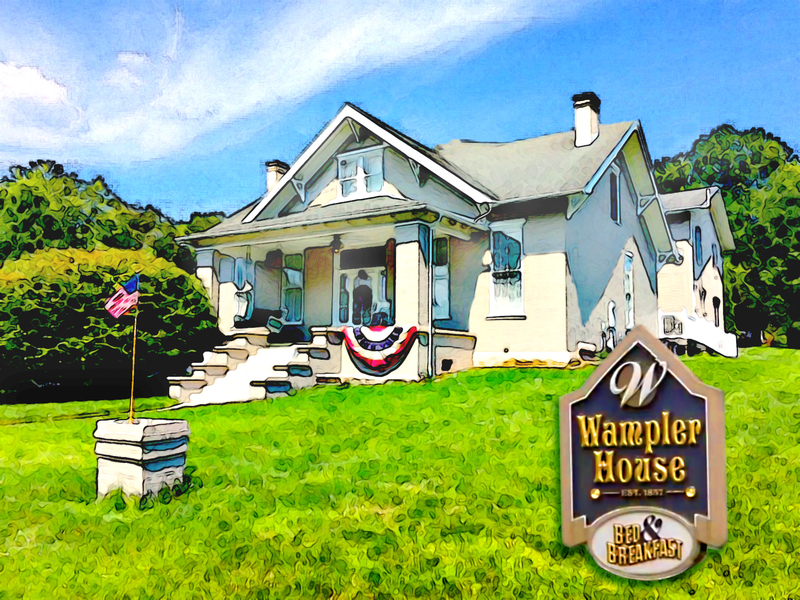 Wampler Suite: A most Elegant and Spacious Suite in Rust and Beige with King-sized Sleigh Bed, Gas-log Fireplace, Sitting area with Day-Bed, 2nd Story Balcony, and large Jacuzzi and Shower in Bathroom. Wampler Suite is a great room for a couple with a student visiting Indiana University. Williams Room: A Charming and Nostalgic Room in the Historic Wing of our Bloomington Indiana Bed and Breakfast, this second floor room features a Gas-log Fireplace, a White Battenberg and Rose decor with Queen-Sized Brass Bed! The Large Bathroom welcomes two in the Garden Jacuzzi Tub plus Shower. Gilcrest & Solmes and Greenwich Bay Amenities. Luxury is affordable at our Bloomington Bed and Breakfast. The Dillman Suite: This Suite is located in the Historic Wing of the House on the first floor with Soft Cream and Rose Décor. It Boasts a Beautiful Queen-Sized Four-Poster Bed and Gas-log Fireplace. It adjoins the Library to make it a Spacious Suite. It has a Jacuzzi Tub as well as Shower in the Bath. Perfect for visiting Indiana University!